Improving our diversity matters for a whole host of reasons. Some of the comments I’ve heard since the General Election about the lack of diversity among our MPs have had a whiff of attacking them for having survived. That’s understandable, but risks undermining our efforts to improve diversity. Part of me wants to make a strong case for setting aside the referendum because people were lied to and leaving is likely to exacerbate rather than help with the things that led people to vote Leave. The logic is impeccable, but is this just denial associated with grief? The risk is that it gets in the way of us providing a liberal vision for a Liberal future when it’s desperately needed if we are not to end up with those south of the border living in “narrow, insular Little England” (I assume Scotland will leave the UK and join the EU). These both matter, and we’ve been advocating them for years. Feeling stung, it is absolutely natural to want fight familiar battles. I’ve heard people pushing for a general election under proportional representation before triggering article 50, and for really good devolution rather than the botched mess the Tories are offering. Is this grief causing us to call for what is unlikely to happen and making us seem irrelevant? Yet voting reform and proper devolution seem key to healing the wounds of Brexit: speaking out of vision rather than grief means we might actually be heard and make a difference. There have been some exciting by-election results recently. It’s tempting to extrapolate from these to the next General Election, but this would be rash: is the desire another attempt to deny reality? We risk harming ourselves if we are too optimistic and then either resent targeting decisions, or are devastated when a General Election doesn’t produce a breakthrough. The fallout of the EU referendum has been substantial. It’s exposed deep divisions in both Conservatives and Labour and is prompting talk of possible re-alignment such as the More United initiative involving Paddy Ashdown: might grief for what’s been lost cloud our sense of future direction? 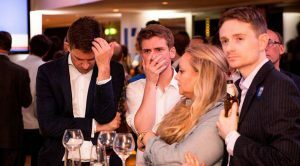 On the morning when we heard the referendum result, I took a risk and sent an email round my local party which named the fact that I had been in tears at the result. It seemed, and seems, important to acknowledge the grief so we could own it and find a place of acceptance and move forward. It’s been an agonising few years. Yet we have some core LibDem values which the country needs; can we find the confidence to let those values be heard? If we are heading into a snap election, can we aside our pain to offer the things the UK needs now, rather than the things we would have seen as important if things had gone differently? First published on Liberal Democrat Voice.